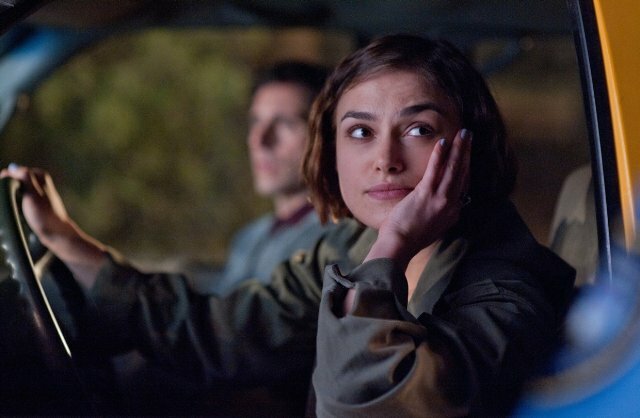 Talky, depressing “comedy” that starts out promising but quickly turns into a lame road trip of sorts that isn’t particularly interesting to watch despite some unique character motivations and an extremely strong performance by Keira Knightley of all people. She’s actually the best thing about this film, even though she spends 3/4ths of it curled up in a ball crying to an otherwise indifferent and unemotional Steve Carell. But the times when she isn’t are quite good, even the comedy bits, which she steals from Carell with ease. Who knew? The film as a whole though is somewhat dull. Again, great opening, but after Knightley is introduced and the road trip starts, it’s not very interesting. Lots of long, stupid conversations and dumb encounters and uninteresting situations, which is odd given the film’s cool end of the world premise. There are moments here and there that are good, but overall, it’s not that interesting to watch. And the relationship **SPOILERS** that eventually develops between Knightley and Carell makes very little sense. It’s supposed to be the heart of the film, yet it’s not very well-developed or convincing, and there’s very little chemistry between the two. Why does she fall for Carell in the end? What about him is so special exactly? The man has no personality in this film! **END SPOILERS** And man are the tonal shifts in this film awkward. It keeps going from comedy to extremely depressing drama and back again; an odd mix that doesn’t work well at all. It’s a mess. Overall, the film isn’t terrible; it has some amusing moments, and the beginning of it, again, is pretty damn good and exciting and funny and all the things the rest of the film would have been had it been better written/directed/handled. Still, again, Knightley is great. I had no idea the girl was this good, actually. But, I don’t know. The film is all over the place, and extremely depressing, but not in the thought-provoking way ala “The Road” but rather in the boring, “god why am I watching this?” way that doesn’t really justify your wanting to kill yourself in the end. Not recommended.